Obituary – Nelms, Helen E. (Proffer-Lobsitz) « Perry High School Alumni Association, Inc.
Funeral will be at 2:30 p.m. Friday in the First Presbyterian church at Norman for Mrs. Garland (Helen) Nelms, 57, of Norman, former resident of Perry. Mrs. Nelms died at 4 a.m. Thursday in Norman Municipal hospital after suffering a heart attack Wednesday afternoon. She had not been ill previously. Mrs. Nelms was the daughter of the late Clevis Proffer and the late Lillian (Craig-Proffer) Lobsitz of Perry. She was born here and graduated from Perry high school in 1930. After completing high school she attended Oklahoma State University and has lived away from this community. 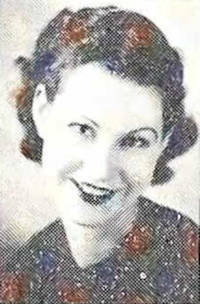 Besides her husband of the home, she is survived by two daughters, Mrs. Linda Rylander and Cathe Nelms, both of the home.